Scientists at Penn State University have successfully controlled tiny nanomotors inside living human cells. Consisting of tiny, rocket-shaped bits of metal, the nanomotors were propelled by ultrasonic waves and steered with magnets. Researcher Tom Mallouk wasn't afraid to talk up potential future applications, saying that the technology could one day be used "to treat cancer and other diseases by mechanically manipulating cells from the inside." 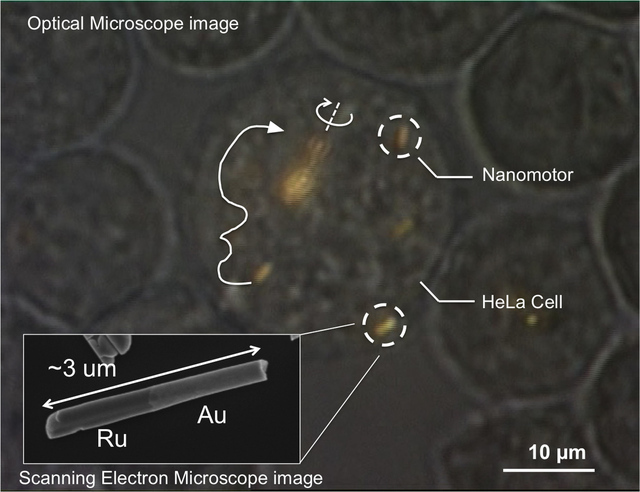 Once inside a living cell, the nanomotors could pulverize the cell's contents like an "egg beater" or just break the cell's membrane, Penn State's note about the research says, which could allow for targeted attacks on specific cells. More importantly, Mallouk says that the nanomotors were able to move independently of one another, instead of the "whole mass of them going in one direction." Though it's a long way off from Mallouk's self-stated dream of "Fantastic Voyage-style medicine, where nanomotors would cruise around inside the body, communicating with each other and performing various kinds of diagnoses and therapy," it is the first time that nanomotors have worked inside living cells. Previously, nanomotors required toxic fuels to operate, which obviously wouldn't work on living tissue. Working inside actual living animals is still a ways off, Mallouk tells CNN that it would be a decade or more before research hit that stage.